A man of dedication and love for his craft. Bob Ross was a genius. The Man With The Afro eluded me up until recent times, not because I intentionally wanted to avoid his body of work, simply because I never came across him. I first learned his name in a meme, where a guy in his mid-twenties asked his friends to paint along a Bob Ross video on his birthday party. I wasn’t really inclined to start painting, so although I liked the idea, it wasn’t enough of a motivation to check out who this Bob Ross person was. But the memes kept on coming. On one, he said we should paint another tree next to the one we already painted, because everyone needs a friend. On another, he was painting happy little clouds. A meme admired his soothing voice, others mentioned how mesmerising his technique was. After a year or so, I couldn’t resist anymore, I had to see what this phenomena was all about. And boy oh boy, was everything true about him! You get sucked into this vortex of admiration watching him work. He speaks a soft voice and tells the viewer — you — that everyone can paint. I never really tried this art form but now even I think I can do it. It’s amazing to see someone put together a painting in less than half an hour at a time. He had over 400 shows, painted over 30.000 paintings throughout his lifetime. His message was? If he can do it, you can do it. He wasn’t pretentious about art and wouldn’t try to use special brushes or paint. 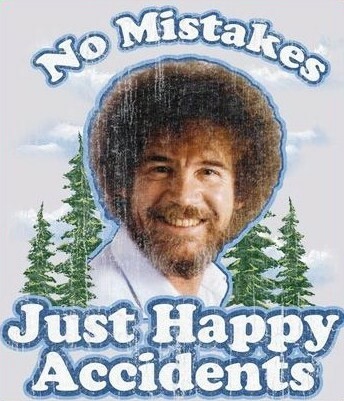 TV Bob Ross was just great. We are not here just to admire his body of work though (I am). As the title of this article suggest, after watching many episodes of his show, I found more and more nuggets of wisdom a modern designer can learn from Bob Ross. I don’t mean that UXers should learn to paint, no. There are a lot of things about him and the way he approached knowledge what we can use in our professional life today. Without further ado, let’s delve in! Bob was all about sharing and he lived up to the title of the show; he shared the Joy of Painting. He built his whole life on this principle. He was never afraid to share his knowledge and became a better artist because he didn’t keep it for himself. We tend to think about knowledge acquired through hard work as our own achievement, therefore we hang to it. There is a feeling of loss aversion, we don’t want to lose that’s ours and worked hard to get. But that’s not how knowledge works. By sharing knowledge we expand on it. It won’t strengthen our competition and it won’t make us less able. By sharing what we know we help everyone who is interested to acquire the same knowledge. They estimated that only 3% of viewers actually went along with Bob during his shows, so 97% of people just watched him paint (which is also a great thing to do in my opinion), although he specifically asked everyone to grab a paint brush and paint with him. He featured people on his show as well. Bob was never afraid to display other people who could do wonderful things as well as he can. Did it make him a lesser person in the eyes of millions? Of course not. It only strengthen his image as an inclusive person and made people admire him more. What if someone does what you do better than you? Learn from them! You might not ever know how to further improve your skills or what new directions to take. By sharing you will attract like-minded people who can learn from each other. Bob Ross painted. A lot. He loved painting and if you watch one of his shows you can tell he did. Doing a TV show was a way to spread his name and to recruit more people to attend his painting classes (we’ll come back to this later). Doing a show (or in our case: providing content online and offline) on a regular basis is challenging. He did 400 episodes of Joy of Painting and although his style was the same all the way through (even the subject matter was very similar), he still managed to grab attention. He did it by doing different versions of his favourite landscapes. So they were all sort of familiar, but different. Push yourself in new directions to keep your audience (and yourself) engaged and interested. You wouldn’t be able to tell, but Bob took his shows very seriously. It looks like he came up with each painting on the spot while shooting an episode, in reality he always painted one version before the show to use it as a reference. He never showed these, though, because he didn’t want to disappoint people by comparing the two (not like you could disappoint anyone, Bob ❤). He had more time to paint the reference image and sometimes he didn’t have enough time in the show to add all the elements. The show versions were always MVPs; he added only the most important features and expanded on them later, if he had time (our most valuable resource). After shooting the episodes, he went home and painted another version of the paintings while someone was photographing the process. These images were used in his books, he made one book for each series. He not only did the TV show (he shot a 13-episode series in a week), he did painting classes, travelled around the country and did other promotional work too. I guess it is partially due to the fact that Bob enjoyed doing what he did. But let’s be honest, how many “passionate” designers have you got in your network? We are all passionate, but not passionate enough to roll up our sleeves and get to work, apparently. Fun fact, Bob Ross did the TV shows for free. He hasn’t earned anything from the shows, it was broadcasted in public television, he even donated most of his paintings to the studio (because his heart was made of solid gold ❤). He made money by doing painting classes and later on by selling painting supplies. He also sold books based on the Joy of Painting series (as mentioned earlier). Bob used the show as a vehicle to monetise on other, adjacent activities that were attached to his business. He put a lot of effort in his business, so naturally he wanted to make a living out of it. He was the epitome of a passionate artist and entrepreneur; anyone who says they are passionate about their craft and don’t do as much as Bob about it, well, these people are lying. Don’t miss out on opportunities that arise while you share your knowledge. By sharing what you can do, you generate interest in yourself and in your work. Be ready to make the most of it. As mentioned earlier, Bob put a lot of effort in his shows. He practised the paintings before the show, and during earlier series, he even practised each stroke before shooting. His presentation got even better eventually, as it should, after all the shows he did. If you enjoy what you are doing, make other people see your enthusiasm. Don’t be afraid of being carried away. If you are not interested in your own work, no one else will be. Include the audience in your presentations. Turn a one way monologue into a conversation. If you do a lot of them, spice things up every now and then. Ask other people to contribute. Use props, sounds, video, whatever. Make people laugh. Think about developing a signature style. Bob absolutely hated his afro, but since it was part of his image, he stuck to it. This is the most important thing. Find enjoyment in the little things that you do. As Bob so thoughtfully puts it, in your world you can do whatever you want to do. Your designs are yours, and yes, you have user needs and business goals to follow, but even that leaves ample amount of space for you to experiment, push boundaries and be creative. There are new software coming out every day, new trends, new everything. Don’t shy away from learning even more, it can mean all the difference not getting bored of what you do. Spread the love and tell your acquaintances about Bob Ross. He’d thank you for that.